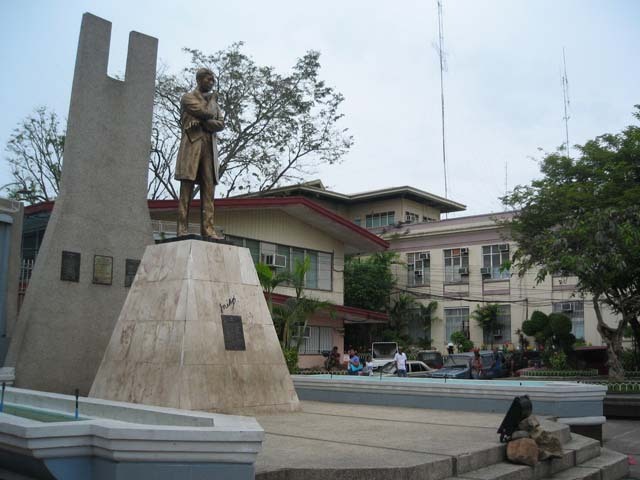 Almost all cities and municipalities in the Philippines have statues of Dr. José Rizal, in honor of the Philippine National Hero. Davao City is no exception. It has its own monument along the historic San Pedro Street, the oldest street in the city. The Rizal Park is close to the City Hall of Davao City, Quezon Park, about 15 meters west of the Sangguniang Panlungsod ng Dabaw, San Pedro Cathedral, and Osmeña Park (formerly Plaza de Oyanguren). It has been the center stage where every significant event in the history and life of Davao City and the Davaoeños unfold, such as informal meetings of government staffs about different city concerns, political rallies and religious fellowships are held, government-sponsored events, free concerts, and street food fiestas are celebrated. The Park is among the chief venues of all major festivals and celebrations in the city, where every Davaoeño has, at one time or another, paraded along the street of San Pedro for the Araw ng Dabaw and danced the "Indak-indak" during Kadayawan Festival. It is located at the seat of religious and political power where the legislative and executive branches of local government form a right triangle with the Archdiocese of Davao at the center. After all, the area where the Rizal Park is situated is Davao City’s Kilometer Zero. The Rizal Shrine at the park was renovated and officially turned over on March 12, 2009 to the then Mayor Rodrigo Duterte, now Vice-Mayor, by MICO President Yvonne. Hello, I should say that Davao was one of the p[Philippines finest city because of its innovative life. It is very historic also and full of delicious food. I once visit Davao and we are planning to visit again with my close friends. Thank you.